Chichester’s new crop of juniors continued their impressive start to the season and, having been runners-up in the opening fixture in April, went one better at Bournemouth with a well-deserved victory. This leaves the club sitting at the top of the table after two matches and looking forward to the next fixture at Horsham in June. The squad on 40 athletes on view were not put off by some outstanding performances by some of their rivals including a number of nationally-ranked top ten marks set during the course of the day. It was the under-15 boys who were largely responsible for the club’s high ranking in match 1 and the 10 man squad again did not disappoint. Multi-eventer Ethan Brown was in fine form and, in setting three personal best marks, gained two firsts and a second to emerge as Chichester’s highest points scorer of the day. A speedy 80m hurdles in 14.3 was followed by a 2.45m pole vault and a javelin thrown of just short of 30m. The sprinting was again spearheaded by Cellan Robinson with two runners-up spots against a very talented Woking athlete with Johnny Simmons and Jeremy Sharp picking up useful points in the B strings. Over 300m, Liam Dunne and JJ Staples formed a new combination to good effect while in the middle-distance events there was an impressive sight of Dunne and Alex Mani well clear of the rest of the field in the 800m with both athletes sub 2.20 while Harry Smith, Sharp and Simmons posted good times in the non-scoring race. Ned Potter and Harry Sage proved a useful combination over 1,500m with the pair just outside five minutes and, together with the rest of the squad showed admirable commitment to the team by filling all the places in the throws and jumps in the absence of any specialist field event athletes in the team. There was a transformation in the under-13 boys squad with no fewer than eight newcomers in the ten athletes competing for Chichester. Only DJ Barth and Sam Sage remained from the opening fixture and Barth again led from the front in the 100m with an explosive start out of the blocks to be just caught on the line. Ollie Beach was equally as impressive over 200m with Zach Entiknapp a useful B string runner on both occasions. Barth then followed this with a win in the hurdles with Beach runner-up in the B string. Tom Hartley and Sage both produced personal best times in the 800m while a combination of Douglas Smith and Eden Murphy gained two runners-up spots in the 1,500m. Sam Spiby produced a 26m javelin throw and was unlucky to have to settle for third with the Havant and Bournemouth A strings both over 30m. Vinnie Conte-Smith was a more than useful back-up in winning the B string with the shot putt combination of Beach and Finn Jackson almost gaining maximum points. To add to a most impressive match from the under-13s, Barth and Comte-Smith combined well in the long jump as did Hartley and Entiknapp in the high jump. Against some very fast athletes from the other five teams, Chichester’s under-15 girl sprinters did well to hold their own with Maya Shankar producing the best times over 100m and 200m with Rosie Compton, Emily Russell and Annabel Eden offering good support. Regular 800 metres pairing of Amber Dodd and Maggie King gained near maximum points over 800m while Caitlin Brown and Annie Gibson notched up useful points over 1,500m. Newcomer Leila Solly came in to partner Rosie Compton in both hurdles and high jump to good effect while she also provided useful back-up to Shankar in the long jump. Alexia Everley came into the team to spearhead the throws with a runners-up spot in the discus and third in the hammer in her first attempt at the event. As with the boys’ team, the girls rallied to fill the string with Brown, Dodd and King in action as well as Molly Hogan-Hussein making her first appearance in the shot. As with their under-13 boys counterparts, the girls are improving from match to match and were not put off by some national standard performances, especially by a very talented Horsham quartet. This was nowhere more evident than in the long jump with jumps of 4.96m and 4.72m from the Horsham pairing making them the top club in the country. For Chichester, Millie Grant had a fine day’s competition in battling hard in the sprints as well as gaining an individual A string win in the shot putt. Fleur Hollyer and Ruby Cousins supported well in the sprints with Cousins almost making it a clean sweep with Grant in the shot. There was a new combination of Nancy Gates and Maya Solly in the 800m while the regular pairing of Nina Moranne and Nicole Boltwood formed their usual reliable combination over 1,200m. The two high jumpers probably had the most demanding task of any pairing throughout the day by not only jumping against two of the top national jumpers but having to endure the wettest conditions of a damp and drizzly day. After well over an hour’s competition the pair emerged with a couple of runners-up spots, a fine reward for the efforts. Perhaps the bravest athlete in Chichester’s whole squad was Mia Brown, who picked herself up after a nasty fall right at the end of the hurdles to finish in second place and then partnered Solly in the long jump as well as helping the 4x100m relay team to a fine second place. 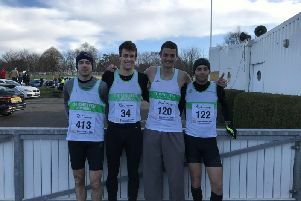 Chichester’s seniors, under-17s under-20s and veterans were also in action at the weekend in their Southern Athletics league match at Horsham and found themselves up against Windsor and Eton with many of the international stars on show. A full report will be in next week’s Observer.